So many of us fell in love with Joanne Fink’s Zenspirations – Letters and Patterning techniques and watching her videos demonstrating them. Well now you can enjoy even more of her whimsical drawing ideas in her new title, Zenspirations Dangle Designs, available now and shipping from Amazon. 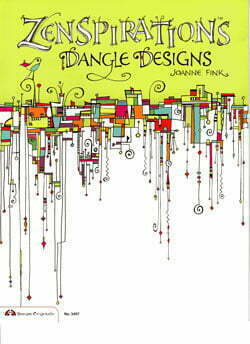 Joanne’s first book contained one dangle design and her new title expands on the theme, explaining in detail how to draw dangles. From the publisher Design Originals, “Zenspirations Dangle Designs are unique patterns that add interest and texture to any design. Gifted calligrapher and designer Joanne Fink share her fun and relaxing techniques for adding dangle patterns to your drawings. Zenspirations Dangle Designs is a 16-page booklet retailing at $8.99, available on Amazon for $6.67. Zenspirations Dangle Designs isn’t Zentangle but I know you’ll enjoy Joanne’s latest addition to expanding your creative drawing techniques. I am so looking forward to getting this book. I think I have every Zentangle book published so far. This will be a fabulous addition to my collection. Just got it, love it! The Dangle Designs are every bit as meditative as Zentangle. I might have been able to figure out how to do these designs without the book but having the ‘recipe’ makes it so much more enjoyable. Thank you Joanne Fink for this contribution! Just received this a week or so ago and love it as much as I do all my previous Zentangle books and I have aquired many!! (Can you say addict? lol) I had tried to work these dangles since first seeing them in ZENSPIRATIONS and simply couldn’t get them to ‘flow’…but now that I have put an order to making them, it is much more relaxing and the results are much neater. Thanks so much Joanne Fink for all of your contributions and inspirations!! And to TanglePatterns’ Linda Farmer for keeping us all informed and connected!!! I am truly a “Tangler4Life” !!!!! She just released the workbook edition to this book. They appear to be recycling “workbook editions” of a few of their old titles. Don’t I already have this book. The title is the same as a book I’ve had for quite some time. I know there’s now this and workbook pgs but still they’ve been available for awhile. I also cannot find one for 6.67 on amazon. The front of mine is like theirs. Thanks. If you look at the bottom of the page you’ll see this review was published in May 2013 and it was available for $6.67 at that time. Design Originals have since republished a workbook edition of most of their titles.